The Milky Way and bright June fireballs star in these dazzling new photos from a veteran space photographer. 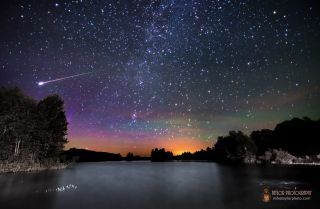 Night sky photographer Mike Taylor captured two spectacular images from Maine. The first image captured was taken June 10 from Branch Pond, Maine, and features bright stars of our Milky Way galaxy in the sky and the faint purple glow of the northern lights. The image also shows a brilliant fireball streaking across the sky. Magenta, purple and green colors can be seen in the tail of the meteor and an orange glow from nearby buildings can be seen on the horizon. He captured this image using a Nikon D7000 camera, Tokina 11-16 mm lens at 11 mm, f/2.8, 30 seconds and ISO 800. Standing in the middle of the road in Maine, Mike Taylor took this photo of a meteor soaring through the sky over what locals call Mo’s Mountain. He captured this photo on June 10, 2013. Taylor took the second image the same day as the colorful fireball over Branch Pond. This image shows a meteor streaking through the sky next to the stars of the Milky Way. From Taylor's vantage point in the middle of a road, the meteor appeared to streak above what locals call Mo's Mountain. He used a Nikon D7000 camera, Tokina 11-16 mm lens at 11 mm, f/2.8, 25 seconds, and ISO 2000. "Although I don't suggest setting up your photography equipment in the middle of a road for any length of time, this spot was a great vantage point and allowed me to shoot for 45 minutes without a vehicle driving by," Taylor said.